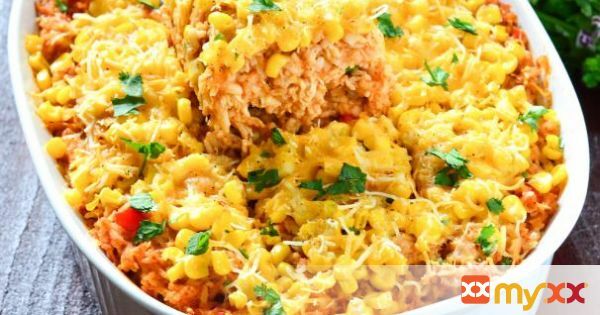 All the makings of a cheesy, bold, chicken enchilada in a comforting rice casserole form. 1. Preheat oven to 350 degrees. Bake chicken breasts in a baking pan for 30-35 minutes, or until juices run clear and chicken is cooked through. Let cool in pan for 10 minutes before shredding using an electric mixer fitted with a paddle attachment or 2 forks. 2. Meanwhile, cook the rice according to package directions or in a rice cooker with 4 cups of water and 1 tablespoon butter. 3. Keep oven preheated at 350. In a large bowl, mix together the chicken, 2 cans of enchilada sauce, refried beans, and half of the cheese. Stir until evenly combined. 4. Add in the rice, seasonings, red pepper, and green onions. Mix well. 5. Transfer mixture into a large casserole dish. Top with the frozen corn and remaining cheese. 6. Bake for 35-40 minutes, or until cheese is melted and bubbly. Garnish with cilantro and serve warm.